What makes you, you? This is the first of a series of posts on individuality. To begin, here are 10 thoughts on individuality. Agree/disagree? Feel free to comment! Individuality. The you-ness that makes you, you. It’s your personality, your character, your history, your responses to situations, your decisions, all combined into one person, you. It’s what makes you unlike any other person on Earth and what makes no two people exactly alike. Everything that makes you who you are—your biological traits, genetic heritage, ethnic background, the place of your birth and upbringing, your current location, all the places you’ve been and worked at, the people you’ve met, the people who have impacted your life, your cultural heritage, your entire life experiences, in the particular order that you experienced them, the books you’ve read, the things you’ve seen—all of these enrich you to tell your own unique story. It gives you a unique lens through which you see the world, a unique perspective that will tinge everything you do. This unique perspective is a gift that you can give to the world. It’s your contribution to society and to humanity. Your individuality is an asset that will enrich our collective human experience. Individuality is especially an asset in creative works, works that have no prescribed formulas and to-do guides, works that haven’t been done before. Face to face with a blank canvas, a blank page, an empty theatre, a research problem, a work emergency, what will you do? Where will you turn to when there’s no manual around? All you’ve got is your wits, your judgment, your wisdom, and your character. The way you use them to tread an uncharted path will be uniquely yours. In these blank canvas situations, I think you’ll find that your individuality is a well, that in your identity lay a treasure of connections and creativity that can manifest into a truly original work. It will not always come out right, but if you keep digging and mining the well, something great and original will come to life. The paradox of individuality is that the person next to you is just as unique as you are. This presents no problem at all, because multiple individualities in turn can combine to create unique teams that produce unique results. As you are limited to your own experiences, others’ can inform and add to your life and to your collaborative work. No two people can solve the same problem completely alike, if they stay true to their identity and not become a carbon copy of someone else. No two doctors perform surgery exactly in the same way, no two people sing a song the same way, no two engineers do calculations the same way. Even in math, a field with rigid rules and laws, no two mathematicians solve math problems the same way. They may end up at the same final answer, but the road to the solution will bear the mark of the author’s individuality. Which is why diversity is an asset. 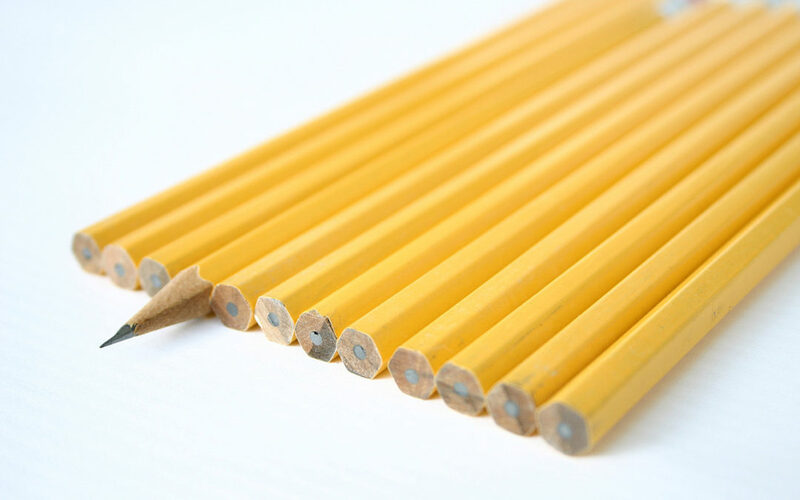 Diversity is both a source of creative inventions and the outcome of originality. The combination of diverse individualities will create diverse solutions, which are needed in solving complex human problems. Don’t worry too much about what other people are doing. Don’t worry too much that your work should or should not resemble someone else’s. Look internally and ask yourself, what would YOU do? There’s something that only you can give in this life. There’s work that only you can do, music that only you can create, books that only you can write, pictures that only you can take. This is your gift to all of us, and we can’t wait to see it. You are more unique than you think you are. 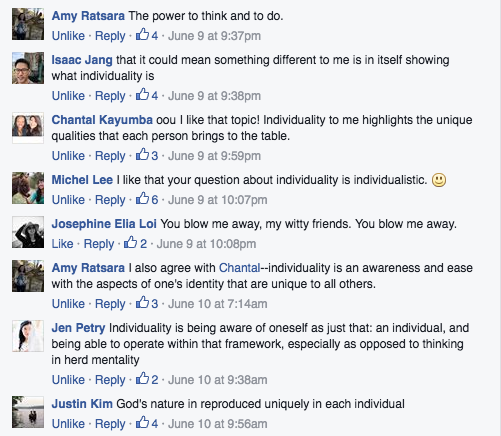 I asked some friends, What does individuality mean to you? 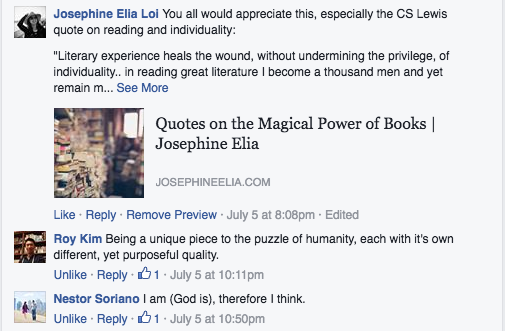 Here are their insightful answers. Want more? See also how individuality and creativity are related, how genius work happens, and how to use individuality as the engine of learning.